Saturday, December 3rd Dance of the Month: Jig | The New York Baroque Dance Co. Dancing the Jig is the solution, not a tighter corset! 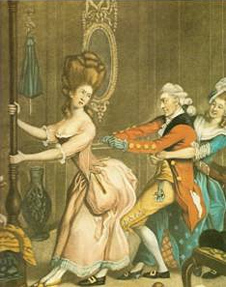 The Jig is energetic and was popular in balls of the 18th century. It may be the secret behind the phrase, “Fit as a Fiddle” … The fiddle was the instrument most associated with the jig or gigue -French , or giga, Italian- it was also a medieval name for a bowed instrument-geige- which is where the German word for violin is derived.